Cairngorm, Ben Macdui, Cairn Toul, Sgor an Lochain Uaine, Braeraich, Aonach Mor, Aonach Beag, Carn Mor Dearg and Ben Nevis. Let me start by stating that this is not a walk for the faint hearted. To complete in less that 24 hours you will need a very good level of fitness and willing drivers to transport you. You might also find the following to be quite useful - good weather, a programmed GPS for the night section and a date as close to the longest day as possible. We started at 8pm from the top Cairngorm carpark and to make life easier on the legs chose to take the boring track up to the restaurant at the top of the funicular then the stone set path to the summit. The easy going on this part of the route will allow relatively fast progress but be careful not to push too much at this early stage. Next it's off across the plateau to Ben Macdui. Navigation here in thick weather can be very tricky so be careful although if the path is found and followed there should be no problem. Lochan Buidhe and the lochan that feeds the March Burn are about the only noticeable features in this area and you should be passing between them. Views to the left should include Loch Etchachan, Shelter Stone Crag, Beinn Meadhoin, Ben Avon and Beinn a Bhuird.The biggest potential problem on this section if you do this overnight is the Old Grey Man! From the summit of Macdui head NW to descend by the Allt a' Choire Mhor to the Lairig Ghru - a steep descent down boulders and slippy grass. Keep a reasonable distance above the burn to avoid the tricky bits at waterfalls etc. Cross the Lairig Ghru path and follow the burn down to cross the North section of the Dee (973 991) and then head SW (take a line towards a dip high up on the ridge of Cairn Toul) across lumpy ground to cross the other half of the Dee at 969 986. Once across, the way up Cairn Toul is obvious if not a little brutal. Keeping in a straight line to the right of the crags above will land you in a suitable position on the ridge (963 978) to turn south and climb the bouldery shoulder to the summit. From here descend WSW again following the corrie edge as it winds its way around An Garbh Choire This is safe in mid summer but if cornices are present this would be very dangerous. There are a couple of gullies that cut back into the corrie edge that would be death traps if the tops were filled with snow. Following a GPS route across here might save a few valuable metres compared with following the cliff edge as some of its projections can be avoided. 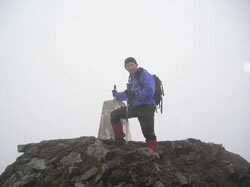 A final gentle climb will see you safely landed at the summit of Braeriach. A path from here goes first E then NE before finally heading N down the Sron na Lairige ridge. This path eventually drops to join the Lairig Ghru path which is followed NNW for a couple of hundred metres before taking the right branch up and over to the Chalamain Gap. Once through the jumble of boulders in the gap a good path is followed (giving great views into the Northern Corries) to the reindeer enclosure at 983 072 where it doubles back on itself to cross the burn by a foot bridge before climbing up to the ski access road and the Sugar Bowl carpark where if you are lucky you will have arranged you lift to meet you to take you onto your next leg at Lochaber. Our estimated time for this leg was 12 hours but we completed in 10.5 giving us a valuable three quarter hour kip before our lift arrived early. Not only did Joe provide the lift but his wife Pam produced a most excellent breakfast at their caravan near Spean Bridge. Other eating places en route could be the Little Chef or the Wollen Mill cafe in Spean Bridge or the Gondola cafe but you would need to check opening times. The second leg starts at the carpark at the bottom of the gondola at 171 774 and follows an horrendously muddy and midgy path up the fire break below the gondola. After leaving the trees cross the downhill bike track and branch off to the right towards the bottom of the chairlift. Here you can head west towards the viewpoint along a path and follow the ridge up to the summit or do like we did because the weather was foul and follow the burn and then the ski tow up towards the summit plateau then across to the cairn. 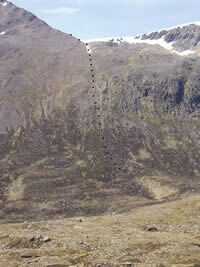 A path leads off south towards the col and then rises through steep ground to the summit of Aonach Beag. There is little shelter at either of these tops or in between so if it's bleak like we had it then lunch will have to wait. From Carn Mor Dearg follow the arete around to the broad shoulder of Ben Nevis and if you are lucky find one of the paths that wind their way up through the boulders to the summit plateau where you will probably be met by hoards of people in their flip flops, shorts and tee shirts. It was so unpleasant when we arrived that there were only two others there! From the summit follow the pony track back down to Achintee where the Ben Nevis Inn can provide a much deserved meal, drink and sit and, if your arrangements work, clean clothes for the journey home. Please let me emphasise again that this is a very serious undertaking and that you need to be very fit to get around in under 24 hours. It's well worth trying the Macdui/Cairn Toul section before hand as I did so that when you are tackling this section in the dark you will have some idea of what lays in store. If you alter the timings then this might not be the case but my thoughts were to take on the dark section at the beginning rather than the end and to make it practical to get picked up at a reasonable hour at the Sugar bowl and to finish early enough to get fed and watered and drive (or be driven) home afterwards. The route was planned using GPS utility and exporting the data to an Excel spreadsheet to get reasonably accurate timings for each section. The GPS route file can be found here but you will need to join the group to access it. 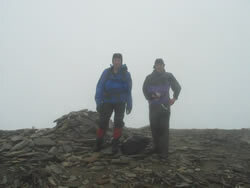 We undertook this walk as part of the Boots Across Scotland Munro Challenge. If you haven't heard of them then have a look at their website (a bit out of date I'm afraid) and maybe even make a contribution to them to help them in their endeavours to support mountain rescue teams across Scotland.